Connie Pillich (left) has told WVXU that she and Gwen McFarlin are running as co-chairs to lead the Hamilton County Democratic Party. Lawyer Tim Burke, who has held the job of party chair for 24 years, is retiring. Pillich told WVXU that she and McFarlin have formed a team to replace Burke. "We want to put together a team of people in the leadership of the party who can move us forward,'' Pillich said. 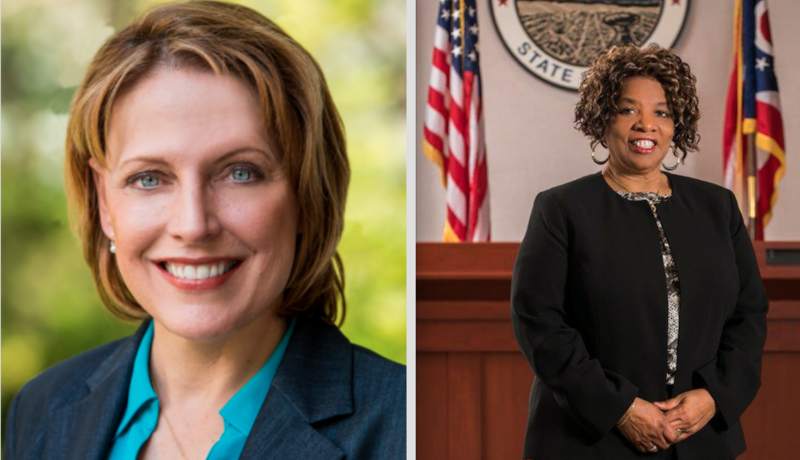 If they are elected by the Hamilton County Democratic Party's central committee on June 9, they will become the first women to hold the reins of the party, which has been gaining ground against the Republicans in recent county elections. Pillich is a former state representative from Montgomery. A lawyer and a former U.S. Air Force officer, Pillich was a candidate in the Democratic primary for governor this year. She dropped out after former Ohio attorney general Richard Cordray entered the race and endorsed Cordray, who won the primary. McFarlin has been a Springfield Township trustee since first being elected in 1995. She could not immediately be reached for comment. It's not clear at this point who, if anyone, will challenge the Pillich-McFarlin team at the June 9 meeting. Former Municipal Court Judge Cheryl Grant has said she is running, but phone calls to her from WVXU have gone unreturned. Former congressman Steve Driehaus was being urged by many in the party to run for chairman and was considering it, but the former one-term congressman recently started a consulting business and decided against it. Driehaus, who -- after serving one term in Congress -- went to Africa for several years to head the Peace Corps' efforts to combat the HIV epidemic in two African nations, told WVXU he is enthusiastically supporting the Pillich-McFarlin team. "I hope they find a team that will put the party on the right path for the future, a young and diverse team that reflects this community,'' Driehaus said. "I believe they will." Pillich said she and McFarlin will meet with their supporters Friday to begin putting together a slate of party officers who will share the responsibility for running the party. Unlike the Republican Party, the Democratic Party chairmanship in Hamilton County is an unpaid position. If they are elected, it will not be the first time that the local Democratic Party has been headed by co-chairs. Driehaus' father, the late Don Driehaus, teamed up with the late William L. Mallory in the early 1990s to head the party. Later, Burke was teamed up for a period of time with former Cincinnati mayor Mark Mallory, who was then in the state legislature.